The dinner bell has sounded on The Kroger Co.’s acquisition of meal kit provider Home Chef. Kroger on Wednesday said it has started rolling out Home Chef meal kits across its supermarket banners. The first kits will be available at Mariano’s stores in Illinois (Mariano's) and Pick 'n Save and Metro Market stores in Kentucky, Michigan, Ohio and Wisconsin. Plans call for Kroger to expand the retail distribution of Home Chef meal kits to more markets next year. Recipes will rotate weekly in stores, which will offer four meal kit choices at a time. Each meal serves two people and starts at $8.50 per serving. 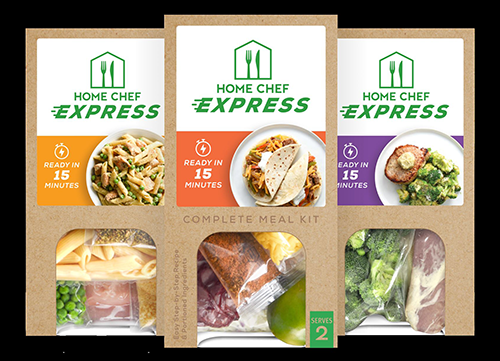 With the start of the national rollout, Kroger and Home Chef said they also have launched a “limited market test” of Home Chef Express, a new quick-cook meal kit with a 15-minute preparation time. "We are excited to introduce Home Chef's new retail meal kits to our store customers. 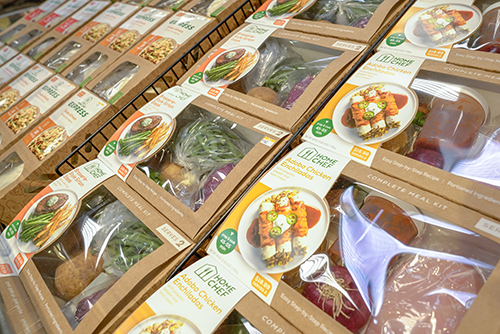 Offering a rotating menu of recipes is one more way we are providing our customers with innovative culinary experiences and choices," Robert Clark, senior vice president of merchandising at Kroger, said in a statement. "The Home Chef meal kits will redefine the way customers shop for, prep and cook their meals." Customers can find store locations carrying the meal kits at HomeChef.com/grocery. This week, Home Chef meal selections in Illinois, Ohio and Wisconsin include brasserie-style sirloin steak, breaded Italian chicken, blue cheese and smoked almond pork chop and adobo chicken enchiladas. Choices for the week of Oct. 15 will be steak strip marsala risotto, chicken chimichangas, chimichurri pork tenderloin, and prosciutto and sage linguine, followed the next week by steak strip chimichangas, teriyaki chicken thighs with smoked almonds, maple-glazed pork tenderloin and turkey burrito skillet. Home Chef Express meal kits will be sold at stores in Kentucky, Michigan and Ohio, starting with Acapulco steak tacos, Mongolian meatballs, chicken alfredo and honey butter pork chop this week and then steak stroganoff, chicken fajitas, pork spring roll bowl and beef chili during the week of Oct. 15. Shoppers also can order from a greater variety of meal kits at HomeChef.com and have them delivered to their door, the companies said. The Home Chef website serves up 18 menu items weekly, including the brand’s no-cook 5-Minute Lunches as well as dinners and smoothies. Pat Vihtelic, founder and CEO of Chicago-based Home Chef, said the in-store offerings give Kroger customers an on-demand meal solution. "We've built a strong business helping people plan their meals in advance. We also know there are customers who want the convenience of a Home Chef meal without having to plan ahead," Vihtelic stated. "We're excited to take this first step in revolutionizing mealtime by bringing Home Chef's signature variety and great-tasting meals directly to Kroger customers. 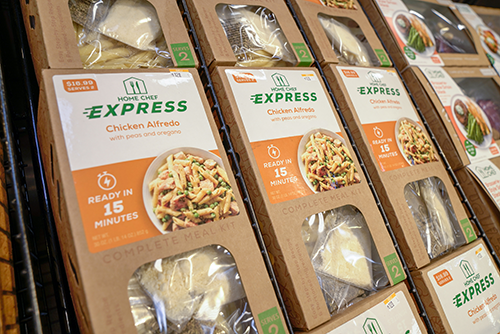 We are also looking forward to introducing our new line of Home Chef Express meal kits that address a major customer need: faster meals." Home Chef delivers more than 3 million meals a month from its distribution centers in Chicago, Atlanta and San Bernardino, Calif. The company’s facilities reach 98% of all continental U.S. households within a two-day delivery window. Home Chef’s sales grew 150% last year to $250 million. Industry observers say the growth path for the meal kit category is increasingly in-store distribution, as evidenced by Kroger’s acquisition of Home Chef, Albertsons Cos.’ purchase of Plated in September 2017, Costco Wholesale Corp.’s launch of Blue Apron meal kits in select clubs this past April, and Ahold Delhaize USA’s rollout of HelloFresh kits at its Stop & Shop and Giant-Landover stores in June. Online subscription meal kit providers have built a following from shopper demand for quick and easy meals, but analysts see waning consumer interest in that service model, pointing to financial struggles at players such as Blue Apron and Chef’d. Meanwhile, retailers have had mixed results with meal kits. According to the Food Retailing Industry Speaks 2018 survey released last week by the Food Marketing Institute, only 15% of the 47% of retailers that have launched meal kit programs consider them successful. Food retail analysts at the recent SN Financial Analysts Roundtable see meal kits a niche market.